In contravention of Article 116 of the Fourth Geneva Convention Israel is denying Palestinian families the right to visit their loved ones in prison. Following the 2006 election victory of Hamas, Israel collectively punished the population of Gaza by denying family visits to all Palestinains from Gaza. One of the main demands of the April 2014 hunger strike by administrative detainees was for Israel to reinstate family visits to Gaza prisoners and whilst Israel agreed to resume the visits on conclusion of the strike it soon reneged on its promise and since July all visits from Gaza are banned. Also vindictively Israel punished the 125 administrative detainees who participated in the hunger strike by banning their families from visiting for 4 months. Now Israel has started to issue 3 month banning orders on family visits, to the families of prisoners with links to organisations opposing the occupation. On September 14th 2014, Ahmad Sa'adat, Member of Palestinian Parliament and Secretary General of the Popular Front for the Liberation of Palestine, received orders banning his family from visiting for 3 months. Hundreds of other prisoners, especially those affiliated with Hamas, Islamic Jihad and PFLP, have similarly received banning orders against family visits. 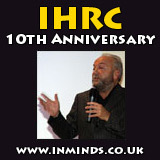 Israel's use of family visits as a weapons to punish prisoners and their families must be opposed. 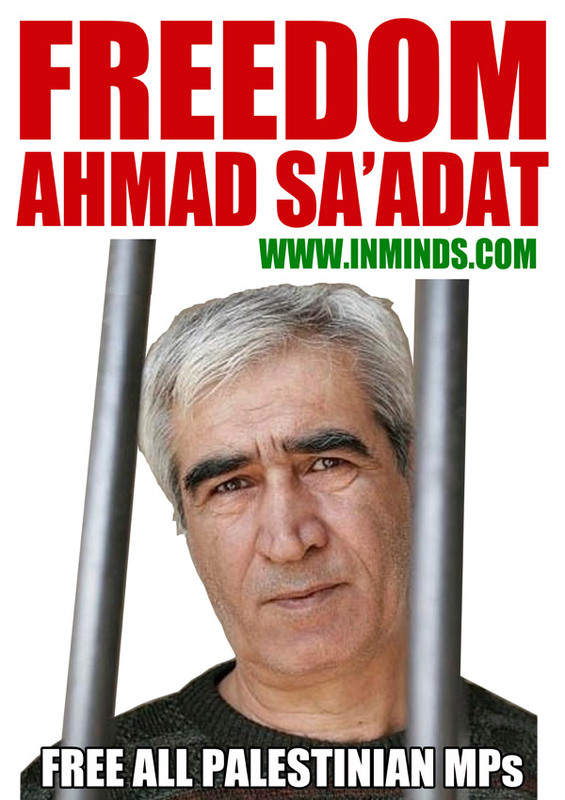 Please join us on friday as we join the call by the Campaign to Free Ahmad Sa'adat to demand freedom for all Palestinian prisoners including Ahmad Sa'adat. The protest will be outside the offices of the CEO of G4S (not outside G4S HQ) at The Peak on Wilton Road. 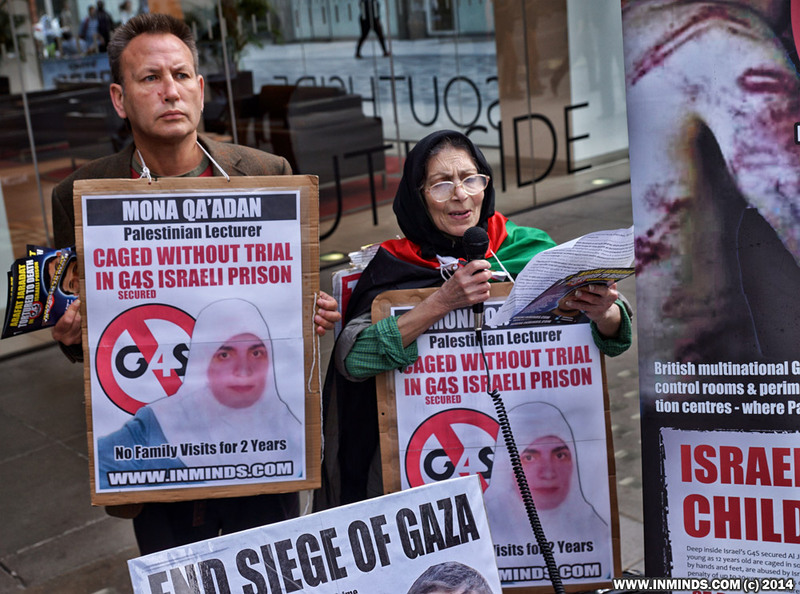 G4S secures the prisons and interrogation centres where Israel cages and tortures Palestinians. In particular we will be raising the case of Mona Qa'adan, who has been denied family visits for 2 years. Palestinian woman university lecturer Mona Qa'adan was abducted 2 years ago in November 2012. She has not been allowed a single family visit in 2 years. Her entire family - four sisters and three brothers, have all been labelled a "security threat" and prevented from talking to her for even a single minute in two years. Mona's illegal detention has been extended 16 consecutive times since her abduction without any trial. In the meantime she her health is suffering with problems in her gallbladder, stomach and high blood pressure. She is caged at the notorious G4S secured HaSharon womens prison. At HaSharon prison Palestinian women prisoners have to endure beatings, insults, threats, sexually explicit harassment and sexual violence, and humiliation at the hands of Israeli guards. They are often forced to undergo degrading strip searches during the middle of the night - forced to squat naked and subjected to intrusive internal body searches, for no reason other than as a punitive measure. Women have been beaten and left tied to their bed for a day and a half and not allowed to go to the toilet as punishment for spilling water. The cells at HaSharon prison are overcrowded, dirty and infected with rodents and cockroaches. There is a total absence of basic hygiene, women have even been denied sanitary pads when menstruating. The heat is unbearable, the windows are closed and covered so that hardly any air or daylight can enter. The food is insufficient, and of inferior quality & dirty, often containing insects & worms, at times there are not enough portions for all the women. This is the third time Mona has been imprisoned by the occupation. Her first arrest was on August 2 2007, she was released on June 20 2008, then she was kidnapped again on May 31 2011, and was released on November 18 2011 as part of the Shalit prisoner swap deal only to be abducted again a year later.